Tip: You can search this page to find words of interest (use the Edit | Find... or similar command in your web browser). How do I upgrade GoldWave? How do I replace my lost copy of GoldWave? Can GoldWave record tapes, vinyl records, or dictation and can it remove background noise? Is GoldWave available on CD or in stores? Is GoldWave available for the Mac? Is GoldWave available for Linux? What is the unlicensed usage counter in the status bar? How do I buy GoldWave and how much does it cost? Is phone support available or can I order by phone? How do I print waveforms? Does GoldWave require administrator privileges? How do I install GoldWave? How do I uninstall GoldWave? How do I move GoldWave to a new computer? What is the beta key? How do I change where GoldWave stores temporary files? How do I set up a foot pedal, foot switch, foot controller, or other USB HID device? Why do I get an "emulated driver" message during installation? Why do I get an error when installing the program? Where do I enter my license? How do I replace my lost license? Can I use the same license on two computers? Can I upgrade a One Year license to a Lifetime license? Do I need a PayPal account to buy a license? Why is PayPal asking for a bank account or rejecting my credit card? How do I record for more than 60 seconds? How do I copy audio from the CD-ROM drive? How do I record from the line-in or microphone? How do I adjust recording volumes? How can I record on a laptop without a line-in? How can I monitor or hear what is being recorded? How can I record 24 bit and 192kHz quality? Why is the record volume always too high? How do I record Internet audio or the speaker output? Why isn't GoldWave listing my "Wave", "Stereo Mix", or "What You Hear" recording device in Windows Vista/7? How do I record phone calls? How do I select a different sound card for recording? How do I record vocals over background music or record and play at the same time? How can I avoid skips, gaps, and stuttering in recordings? Why is Windows sluggish after a long recording? Why is recording not working? How do I select a different playback device? How do I playback just the end of the selection? Why is playback not working? How do I use DirectX audio effects? How do I use VST audio effects? How do I extract or remove vocals (lyrics) from music? How do I exchange/swap the left and right channels? How do I change the bass or treble? How do I change the speed/tempo/beats-per-minute? How do I edit or replace just the left or right channel? How do I create a stereo file from two mono files? Why are many of the editing commands grayed or disabled? How do I move the selection range without changing the length? How do I remove pops/clicks? How do I remove hiss, hum, and buzz noise? How do I open or create cda files? How do I edit or convert iTunes? Does GoldWave support mp4, m4a, mov, or aac files? Does GoldWave support RealNetworks ra, ram, or rm files? Does GoldWave support DSD files? Does GoldWave support MIDI files? Does GoldWave support Olympus DSS files? Does GoldWave support Audible files? How do I compress a sound file to save hard drive space? How do I save files in MP3 format? Why do some MP3 files open as mono, silence, or noise? Why do I get a "no codec" error when saving MP3 files? Does GoldWave support MP3Pro files? How do I recover a temporary (gw?? ?.tmp) file? Can GoldWave create audio CDs? Where can I find information about creating audio CDs? What audio format should I use when creating audio CDs? How do I burn a large file as a continuous play CD with tracks, but no silence/gaps between tracks? The latest version of GoldWave is available on the GoldWave download page. GoldWave Inc. does not announce potential software release dates. Minor updates will likely be released throughout the year. Please check the News section on the main website for updates. To upgrade GoldWave, download the latest self-installing file and run it. Install it into your existing GoldWave folder to replace all the older files. If upgrading from a beta version, it is recommended that you uninstall the beta version first. Otherwise it is best to install over the existing version so that all your settings and presets are retained. Later you can safely uninstall any older versions listed under Add or Remove Programs in the Windows Control Panel. When upgrading from v5 to v6, settings and presets are not transferred automatically due to potential incompatibilies. Use the Transfer Settings From v5 button on the GoldWave Setup window to force settings to be transferred. GoldWave Setup can be found on the Windows Start menu. You can use a stereo cable to connect your cassette player or amplified turntable output to the Line-in socket on your computer. For dictation, connect a microphone to the Mic socket. Once connected, use GoldWave to record audio to your hard drive and enhance/restore it. The Pop/Click and Noise Reduction filters help clean noisy vinyl recordings. After restoring the audio, use CD-R software to write the files to a disc. For more information about recording audio, see this link. For more information about creating CDs, see this link. Also see Appendix D in the manual (Help | Manual in GoldWave) for a step-by-step tutorial explaining how to record and restore vinyl records. GoldWave is available by download only. The file is under 20MB and takes only a few minutes to download. Although you are welcome to make a backup copy on a CD, you can always download a copy from the website when needed. Since upgrades are free, it is best to download the latest version rather than using an old CD or backup copy. Since there is no real advantage to providing a CD, that option is not offered. GoldWave requires a minimum 1.5GHz Pentium 4 (or compatible processor), a mouse, 256MB of RAM, 20MB of disk space, and a sound card. For best performance, a 2GHz or faster processor with 512MB of RAM or more is recommended. Windows XP (SP2), Vista, 7, or later is required. Older versions of Windows will not run recent versions of GoldWave, but you can install GoldWave v4.26 on those systems. Currently GoldWave is available only for Windows PCs, but it has been reported to work under Wine (except for the CD Reader tool). For similar native Linux software, try Audacity. No. You can download and try it for free, but you are required to buy a license if you decide to keep using it. The evaluation version expires after a certain amount of use. The status bar counter gives you a good idea of how much you use GoldWave. It keeps a running total of all the commands you have used since installing GoldWave. The counter is completely removed when GoldWave is licensed. See the Buy Now page for details. Is phone support available or can I buy by phone? Sorry, GoldWave Inc. currently does not provide phone support/purchasing. For support options, see the Support page. For purchasing options, see the Buy Now page. In Windows you can capture the active/top window by using the Alt+Print Screen keys (near the F12 key). The window image is copied to the clipboard. You can then start the Windows Paint accessory and Paste the image for editing and printing. In Windows 7 use the Snipping Tool to capture part of the screen and save it to a file. Most of the commands in GoldWave include a Help button. You can use the Help | Contents menu command to find additional information. A detailed manual is located under the Help | Manual menu. If you've encountered a problem, try the Troubleshooter. Also check the forums. For books on the subject, search on Amazon.com for "computer audio editing". No. GoldWave works for basic users with minimal privileges. It is recommended that GoldWave be installed by an administrator so that it can be installed in the standard Program Files folder. However, it can be installed by a basic user provided it is installed in a folder that the user has write access to (basic users do not have write access to the Program Files folder). When the program is installed by the administrator, basic users will be prompted to install the default presets and settings when they run the program for the first time. Elevated privileges are not required to run the program. Simply download the self-installing file and run it. It will ask you where to install GoldWave and whether or not to create shortcuts and menu items. If you need to work with MP3 please note that the LAME MP3 encoder may be required. If you have any trouble installing GoldWave, try the Troubleshooter. Administrator privileges may be required on some versions of Windows during installation to install it in the Program Files folder. GoldWave does not require administrator privileges after it is installed. Use "Add or Remove Programs" under Start | Settings | Control Panel | Add or Remove Programs, then select the GoldWave item and choose the Remove button. If you've upgraded GoldWave, there may be several entries. It is safe to remove all older entries without affecting the current version. If you are upgrading, it is best to install the upgrade before uninstalling the older version. That will retain your current settings. Download and install the latest version of GoldWave on the new computer. Enter your license into the program after it is installed. Be sure to uninstall GoldWave from the old computer. To transfer settings and presets to a new computer, use Start | Programs | GoldWave | GoldWave Setup and choose the Backup Settings button on the old computer to save all settings to a file on portable or network storage (USB drive, memory card, etc.). If you backed up settings using v5, then you must install v5 on the new computer to restore the settings (v5 and v6 store settings differently and are not compatible). Use the Restore Settings button on the new computer to copy the settings from that file. You must reselect the playback, recording, and volume devices (press F11, Volume tab) in GoldWave to match the new computer's hardware. To copy settings from v5 to v6, use the Transfer Settings From v5 button in GoldWave Setup in v6. Download and install the latest version of GoldWave. Enter your license into the program after it is installed. Your current license will work in the latest version. Use this link to request a copy of your license information. If you are unable to find the beta key, please do not install the beta. You are unqualified to use it. If you contacted GoldWave Inc. requesting the beta key (despite being asked not to), you will be directed here. The ability to read all instructions and follow them is a mandatory requirement for beta testers. By default, GoldWave uses the standard Windows temporary folder to store audio while editing. Use the Options | Storage command in GoldWave to change the Temporary folder setting to a different hard drive and folder or use RAM instead. How do I set up a foot pedal, foot switch, foot controller, or other USB HID devices and joysticks? In the "Joystick/foot controller" box, select "Foot pedal or buttons". Choose the Configure button to assign the pedals (or buttons). GoldWave uses DirectX to play and record audio. If your system does not have a DirectX compatible sound driver, Windows will try to emulate DirectX functionality using your current driver. This may cause stuttering or intermittent playback/recording on some systems. It is best to upgrade your sound driver to a DirectX compatible version. If one is not available, you can increase the Latency setting in GoldWave. To do that, use the Options | Control Properties command (or press the F11 key), then select the Device tab, then move the Latency fader to the right. Also see if any other non-emulated playback devices are available in the drop down list. Your system may need updated sound or video drivers. Try the Troubleshooter to find a solution. You may have received an incomplete download. Try downloading another copy. An old version of GoldWave may still be running. Be sure to close GoldWave before installing an update or try restarting your system. You may need to log in as "administrator" or change the User Account Control setting. GoldWave does not require administrator privileges after it is installed. A license is similar to an activation code that unlocks the evaluation version and removes all limits and reminder messages. A Lifetime license never expires and works in future versions, giving you free upgrades. A One Year license expires after one year, then a new license is required to continue using the program. Internet access is not required (or used) for activation and the license is not tied to a specific computer. All license information must be kept confidential. If a license becomes public, it will be revoked by GoldWave Inc. and will not be replaced. You may buy a license online using the Buy Now page. Warning! Licenses are not sold on eBay. Any eBay listings are unauthorized. Also avoid any sites selling a discount or OEM license for GoldWave because there is no such thing. Such sites are selling pirated software and the license you (may) receive will not work in future versions of GoldWave. Enter your license into the program (not the website). Click here for details. Use the Relicense form to request a copy of your license. If you are the only one using the software, then you can install GoldWave on both computers (such as a desktop and a laptop) and use the same license on each. If two people may be using the software at the same time, then separate licenses are required for each computer. No. A One Year license cannot be exchanged or upgraded to a Lifetime license. A Lifetime license is an excellent value. Many lifetime users have received free upgrades for over 20 years! No. You can use the Stripe (default) payment system to place the order with a credit card. If you choose to use PayPal and your credit card or email address is associated with a PayPal account, then PayPal requires you to log in to complete the order. Otherwise you can buy through PayPal using a credit card without a PayPal account. Look for and choose the link to continue without an account on the PayPal page. PayPal has a lifetime spending limit (their website barely mentions it, so try a Google search) on the number of credit cards purchases you can make before you must provide additional information to verify your identity. PayPal may insist that you provide a bank account to lift the restriction. Also PayPal may reject a credit card order if your credit card is already associated with a PayPal account. Unfortunately GoldWave Inc. has no control over these PayPal policies and regrets the inconvenience they cause. If you have any difficulty using PayPal, please use the Stripe payment system instead. When creating a new file (File | New), the default duration is one minute. Select or enter a longer time in the Length box in the New Sound window. If you do not know how long recording will last, you can enable the Unbounded recording option under the Control Record Properties (press the F11 key then choose the Record tab). You should still specify an ample length when creating the file, otherwise you will not be able to see recording update past the initial length (even though recording will continue). To record in GoldWave, you need to make some connections, create a new file, select the recording input, adjust volumes, then start recording. If you want to record from a CD, use the Tool | CD Reader command instead. Connect the cassette deck, amplified turntable output, radio, or other audio device to the computer's Line In socket (usually blue). Or connect a microphone to the Mic In socket (usually pink). Do not connect an line output to the Mic In socket because that will cause distortion and may overload the sound hardware. Use the File | New command to create a new file. For CD quality recording, use stereo and a rate of 44100Hz. You can enter the recording duration in the Length box. Once the file has been created, you need to select the recording input on your computer and adjust the volume. In GoldWave use Options | Control Properties or press the F11 key. In the Record area, select the device you want to record (Line, Microphone, etc.). If the device isn't listed, make sure it is connected and turned on. Use the Volume fader to adjust the volume level at any time. Optional: Use the Test button to test the device and adjust the volume. Troubleshooting information related to Vista, 7, and later, can be found here. Use the Options | Control Properties command or press the F11 key and choose the Volume tab. It displays recording sources and volume levels. See the help for more information. Select either the Line item or the Microphone item, depending on the connection you are using. Use the Monitor input option on the Record tab to activate the visuals and level meters. Choose Options | Properties from the menu. In the Adjust volumes for rectangle, click on Recording. Make sure that "Line" and "Microphone" (or other sources of interest) are checked in the Show the following volume controls list. You should now see volume controls again, but these will be for recording sources instead of playback. Each source has a Select box. Check the box (5) for the source you want to use and make sure that the volume is not at the bottom (6). You should uncheck all other Select boxes to prevent noise on those source from being recorded. Important! Make sure the volume controls title changes to Recording Controls. If not, then you must go back and follow the above steps. If you find that the recording volume is too low or too high, no matter how you set it, check to see if your sound card (or external device) has a master recording volume control and adjust that volume. In some cases, you may need to adjust the playback volumes as well. Some sound cards feed the volume of the playback into the recording, making it necessary to adjusting both controls. To view the playback volume controls, right-click on the speaker icon in the taskbar and select "Open Volume Mixer" or "Open Volume Control". Choose the red Record New button on the Control window or press F9 to start recording. To record into an existing file use the Record Selection button or Ctrl+F9. Warning! Be aware of potential feedback issues. If a microphone is placed too close to amplified speakers, feedback will occur, resulting in poor recording quality or damaged equipment or hearing. Choose Control Properties from the Options menu in GoldWave. Choose the recording device you are using in GoldWave. Check the "Listen to this device" box. A slight delay/latency in the playback may occur using this method. Some devices (not as common now) have a direct analog connection between the recording input and the output. In that case you simply need to unmute the input so that is passes directly to the output. This method is preferred (if available) since no latency occurs and the recording device remains inactive. Choose the playback device you are using in GoldWave. Unmute the input you want to hear. If no "Unmute" items are listed, this method is not supported by your computer. If you are not using an external USB device, then use the Windows Volume Control accessory under Start | All Programs | Accessories | Entertainment | Volume Control to make sure the source you are recording is not muted. Some sound card drivers will mute the input to prevent feedback whenever you start recording, so you may have to unmute it again after recording starts. If you are using a USB audio device for recording and a sound card for playback, there is no direct audio connection between the two. You'd need to connect speakers to the USB audio device (if possible). Another alternative would be to configure GoldWave to allow playback and recording at the same time. Use Start | All Programs | GoldWave | GoldWave Setup and check the "Allow playback while recording" box. After you start recording, wait about a second, then start playback to hear what's being recorded. One other option is to get a splitter cable so that the audio output can be connected to separate speakers and the computer's input or the USB audio input at the same time. A 192kHz sampling rate for audio is mostly a waste of space and may	even lower quality. See this article for details. 192kHz files will not sound better, will take much more storage space, and will be much slower to process. Such a high rate only makes sense for special applications, such as recording bat or dolphin ultrasound. Standard rates such as 44.1kHz and 48kHz are recommended. If you require a different rate and the rate is supported by your hardware, you'll need to turn off "Shared" quality and select "PCM 16 bit" or "PCM 24 bit" instead (explained below). Create a new file with the sampling rate required, then use the "Record Selection" button (not the "Record New" button, which uses the device's default rate). To select 24 bit quality in GoldWave, choose Options | Control Properties (or press F11), choose the Device tab, then set the Recording quality to "PCM 24 bit". Not all devices support that quality, so you may get an error when trying to record. If so, try "PCM 16 bit" instead. A line-level output must be connected to the computer's line input (blue) for best quality. If you connect a line-level output, such as headphone or stereo RCA outputs, to the microphone input, that will overload the microphone input, causing excessive volume and distorted recording. Some modern microphone inputs are dual purpose and can be configured to accept a line-level or microphone-level signal. You may be prompted to select the purpose when you plug something in or you may have to configure it under Control Panel. Some computer microphone inputs are mono and cannot receive stereo audio. If you have a laptop that does not have a line input, you will need to purchase a USB audio device that has one, such as the Griffin iMic or similar device. 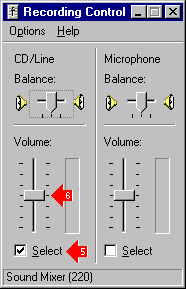 In Windows Vista, 7 and later, select the "LOOPBACK" recording device in GoldWave. See "Stream Recording" in the GoldWave help for more information. 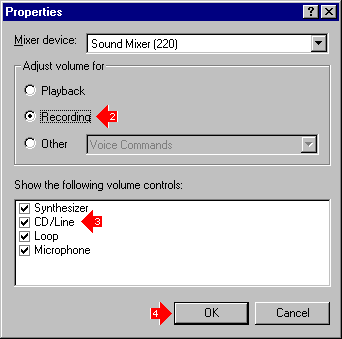 For Windows XP and earlier, select the "Stereo Mix", "Wave", "Wave Out Mix", "What U Hear" or similarly labelled source or device (the actual name depends on the sound card and driver). Some computers do not have any way of recording the audio directly. You will need to buy a short stereo splitter cable to connect the speaker output (green) to the Line-in (blue), then select "Line" as the source (or device). Another alternative is to use a virtual sound driver like Total Recorder. Vista/7	hides or disables recording devices such as "Stereo Mix", "Wave", "Wave Out Mix", and "What You Hear" and some Vista/7 drivers do not include them at all. Select an appropriate LOOPBACK recording device instead. See "Stream Recording" in the GoldWave help index for more information. Unless you have a special sound card that has a phone jack (and a phone source), you will need to purchase a telephone recording adapter. Connect the adapter to the Microphone socket (pink) on the sound card and select "Microphone" as the source (Caution: you may need to connect to the Line socket, depending on the adapter). Another alternative is to purchase a USB telephone recorder, then select that device in GoldWave for recording (press the F11 key, Device tab). Use the Options | Control Properties command (or press the F11 key), select the Device tab, then select a different recording device from the drop down list. Create a new file for recording the vocals with a length at least a few second longer than the music file. If you cannot hear the microphone input on your speakers, set up monitoring for the microphone device. Select the correct recording source. If your sound card has a "LOOPBACK", "Stereo Mix", "What U Hear", or similar source that records whatever you hear on your computer speakers/headphones, select that source. That allows you to record both the music and the vocals at the same time. If not, select the microphone source for the vocals. Tip: Use headphones to prevent echo and feedback caused by the microphone picking up output from speakers. Start recording by clicking the red Record Selection button (or press Ctrl+F9). Click the mouse on the window containing the music and start playback (press F4). You are now playing and recording at the same time. If your sound card had a "LOOPBACK" source, you are done. The window used for recording should contain a mix of both. If you used the microphone recording source, you will need to copy the music and mix it with the recording after recording is finished, as explained in the next few steps. Use Edit | Copy to copy the music. Click on the window containing the recording, then use Edit | Mix. Adjust the start time and use the preview button to align the audio. Choose OK to mix the music. To add commentary over music with automatic fading of the music, use Effect | Voice Over. Select on the Device tab under Options | Control Properties and make sure you have the correct recording device selected and that the device is not listed as "emulated". Restart your system before recording. Disable your virus scanner (temporarily). For long recordings, disable the screen saver and power management. If you have a large second hard drive, use Options | Storage in GoldWave to set the Temporary storage folder to that drive (such as D:\). Try switching between RAM and hard drive storage in GoldWave (use Options | Storage). Contact the sound card manufacturer and request an updated driver. Disable or enable DMA or UDMA for the hard drive (BIOS setting). Set a fixed amount of "virtual memory" in Windows. Configure the minimum and maximum virtual memory limits to 1GB, for example. See the Windows Help for more information. Some sound drivers are unstable and cause poor performance in Windows when used for long periods of time. Restart your system and install an updated driver to correct the problem. Most recording problems are caused by setup problems or bad drivers. Try the Troubleshooter to find a solution. Also use the Test button in GoldWave, which is located on the Device tab of the Control Properties window (press the F11 key). Use the Options | Control Properties command (or press the F11 key), select the Device tab, then select a different playback device from the drop down list. If you are using an "emulated" playback device or you have a slow system, playback may stutter. Try increasing the Latency setting under the Device tab of the Control Properties window (use Options | Control Properties or press the F11 key). Right-click on one of the playback buttons in the Control window (or press the F11 key) and choose the Finish option. Or, right-click on the Sound window graph and choose the "Play From Here" command. Most playback problems are caused by setup problems or bad drivers. Try the Troubleshooter to find a solution. Also try the Test button in GoldWave, which is located on the Device tab of the Control Properties window (press the F11 key). First, install the main DirectX audio plug-in for GoldWave. Next, install the DirectX audio effect by following the installation instructions for the effect, if it isn't already installed. If it is installed, you do not need to re-install it. Finally, use the Options | Plug-in | Effect | DirectX command in GoldWave to enable the effect for use in GoldWave. Restart GoldWave. The effect will appear under the Effect | Plug-in | DirectX menu. GoldWave does not support VST plug-ins directly yet, but you can install a DirectX VST wrapper plug-in to use them through GoldWave's DirectX plug-in, or you can use them through the GWAmp Winamp effect hosting plug-in with the VST Winamp Bridge. For a DirectX wrapper, use the Effect | Plug-in | DirectX menu to select the wrapper effect, then select the VST effect to use. For the Winamp Bridge, use Effect | Plug-in | GWAmp | GWAmp, select the VST Winamp Bridge effect, then configure the effect to select the VST effect to use. Use Effect | Stereo | Reduce Vocals or Effect | Stereo | Stereo Center. These effects only work in stereo files when the vocals are exactly the same in both the left and right channels. Most modern recordings apply some stereo effects to the vocals, making complete extraction or removal impossible. A detailed tutorial can be found here. Related information can be found in the forum here and here. To save yourself a lot of time and effort, search for a karaoke version of the song first. iTunes has karaoke versions of many popular songs. Use the Effect | Stereo | Channel Mixer command. Use the Effect | Filter | Equalizer command. The left-most faders control bass. The right-most faders control treble. Use the Effect | Time Warp command. To change the speed without altering the pitch, select the Similarity or FFT algorithms. Use the Rate algorithm to change the playback speed when recording a 78 rpm album at 33 rpm, or when using high speed tape dubbing. Use the Edit | Channel menu to select a single channel, then use the other editing command to change or replace it. You'd use the Edit | Channel menu and the Copy and Replace commands. When asked to update the file, choose "Yes"
Many of the editing commands require audio to be copied into the clipboard first. Use the Edit | Copy command first. You can use the View to move the selection. Use View | Selection to align the view with the selection. Scroll the view to the position where you want to move the selection range. Use Edit | Select View to move the selection to the view. Use the Effect | Filter | Pop/Click command. Start with a tolerance of 1000 or higher first. If some clicks still remain, select shorter sections of audio and use the Pop/Click filter again with a lower tolerance setting. The Effect | Filter | Noise Reduction command removes those kinds of noises. Play the file to find a section of audio that contains the noise by itself. Select that section (usually no more than one second is needed), then use the Edit | Copy command. See the help for more information about selecting part of the file. Select the entire file (Edit | Select All). Use the Effect | Filter | Noise Reduction command. Select the Use Clipboard envelope option or select the "Clipboard noise print" preset. Preview the settings or choose OK. If the noise is loud compared to the rest of the audio, some distortion (tinkling, chirping, or tinnyness) may occur. Lowering the Scale setting or increasing the FFT Size setting may reduce it. Some distortion may be unavoidable for loud noise. CDA files are artificially created by the Windows CD-ROM driver. They do not exist on the CD itself. They are only 44 bytes in size and do not contain any audio. They hold track times and provide a file based mechanism for referring to specific tracks. They make it possible to drag-and-drop a track for playback in programs like Media Player. To copy audio tracks from a CD in GoldWave, use the Tool | CD Reader command. To create audio tracks, separate CD-R software is required. If your iTunes are in M4P format, then you must upgrade then to iTunes Plus to change them into M4A files. M4A files can be opened and converted in GoldWave (see the question below). You can use GoldWave's File | Batch Processing command to convert your entire iTunes Plus library to any file type that GoldWave supports. Support for these file types depends on the version of Windows you have and the encoding contained in the file. All these file types should open in GoldWave v6 on Windows 10. You may need to use File | Save As to save the audio in a different format after editing. GoldWave v5 supports these files provided you have QuickTime installed. Files can be opened and converted, but cannot be saved directly. Use File | Save As to save in a different format. Note that encrypted files (such as m4p) are copy protected and cannot be opened (see the question above), but they can be upgraded in iTunes. These files are created by RealNetworks software. RealNetworks has a strict license prohibiting the use of software capable of converting files to other formats. Therefore GoldWave cannot support these files. The only solution is to play the file using RealNetworks' software and record the sound output using GoldWave. No. DSD audio cannot be processed directly, therefore Goldwave will not support it directly. Use other software to convert the DSD data to Wave PCM. Recent versions of GoldWave support sampling rates up to 500kHz, which will handle the converted data. GoldWave is a digital audio editor, but most MIDI files do not contain any digital audio. They are like sheet music. They only have information about how to play music and not the music itself. Essentially, they contain a set of instructions that determine what instrument should be played, the pitch it should be played at, and when and how long it should be played. The audio for each instrument is actually stored in your sound card hardware or synthesized by the computer, which means that MIDI files do not need to hold any audio at all. While MIDI files cannot be converted directly to digital audio, they can be translated indirectly by MIDI players and by some MIDI programs. You can play the file in Windows Media Player and record the sound output in GoldWave. GoldWave does not support DSS files. Use the Olympus DSS Player software to convert the file to Wave format. On May 24, 2004, GoldWave Inc. received a "cease and desist" letter from Audible Inc. claiming that information on this website was being used to circumvent copyright protection under the "Digital Millenium (sic) Copyright Act" and demanded that all references to Audible be deleted. Therefore all Audible information has been removed or censored. GoldWave Inc. will not answer any questions or provide any support related to that format. GoldWave was never designed to decode Audible files specifically and contains absolutely no code to circumvent DRM. Its ability to do so originated entirely and exclusively from the flawed design of the Windows decoder developed and installed by Audible Inc.
GoldWave supports many files types, such as Ogg Vorbis, MP3, Windows Media Audio, FLAC, and others. Use the File | Save As command and select one of those file types. Different attributes will be displayed depending on the type. In most cases, a kbps number will be shown. Selecting attributes with a smaller kbps value will give greater compression, but lower quality. Caution: If you intend to edit the file later, do not save it in a compressed format. Quality is lost each time a compressed file is opened and re-saved unless a lossless format is used (such as FLAC, or WMA with Lossless attributes). To save and create MP3 files the LAME MP3 Encoder must be installed. Recent versions of GoldWave will download and install the encoder automatically if you have an active Internet connection when you save the first MP3 file. Due to a change the the web server, older versions of GoldWave may not be able to download the encoder automatically. Download a copy of the LAME MP3 zip file. Important: Download the 64 bit version if you have GoldWave v6 or later and the 32 bit version for GoldWave v5.70 or earlier. Open the download and find the lame_enc.dll file. Copy the lame_enc.dll file into your Documents folder. Now when you try to save a file as MP3 in GoldWave, use the Browse button instead of the Download button on the Encoder Download window to specify the folder where the lame_enc.dll file is located. To save in MP3 format, use File | Save As and select the MP3 type or ("MPEG Audio" for older version of GoldWave) and one of the listed MPEG attributes. Use bitrates of 160kbps or higher and a sampling rate of 44100Hz for high quality. If you get an error message, make sure that the lame_enc.dll file is installed correctly. See this link for additional information about working with MP3 files. GoldWave supports only Layer 3 MPEG. It does not support Layers 1 and 2. To save an MP3 file in CD compatible Wave format, see this link. Due to licensing/patent issues, encoders cannot be included with GoldWave. Why do stereo MP3 files open as mono, silence, or noise? This is caused by an outdated or missing MP3 decoder module. Make sure you have the latest version of Media Player installed on your computer. It includes the required MP3 decoder used by GoldWave. If you are using the N or KN version of Windows, you'll need to install the Media Feature Pack. You must have a copy of the lame_enc.dll file on your computer. See this link for more information. GoldWave does not support mp3PRO files. Estimated demand for a reasonably priced mp3PRO plug-in for GoldWave is less than the minimum royalty of $15,000 per year. However, third party developers who already pay mp3PRO royalties are welcome to create and sell an mp3PRO plug-in for GoldWave. If a power failure or Windows crash occurs while using GoldWave, you may be able to recover the temporary file provided you are not using memory storage. Use Options | Storage to determine if Memory is selected (default). If it is, then there are no temporary files. Everything is stored in memory and cannot be recovered. If Hard drive is selected, then temporary files are stored in the folder indicated. See the instructions for v5 below. Use the Options | Storage command to determine the location of the temporary folder. Use File | Open and browse to the folder to open the gw?? ?.tmp file in GoldWave. If the "File Format" window appears, select the Raw file type and the "IEEE float signed 32 bit, little endian" attributes with either "mono" or "stereo". Set the rate for the file (44100 for CD). Use the Options | File command to determine the location of the temporary folder. Open the gw?? ?.tmp file in GoldWave. You'll need to select the PCM format and the "16 bit signed" attributes with either "mono" or "stereo". Set the rate for the file (44100 for CD). GoldWave does not include audio CD creation tools. You will need to use a separate program to write files to a blank CD as audio tracks. See the CD-Recordable FAQ for a list of CD-R programs or use the Burn feature in Windows Media Player. Standard audio CDs contain PCM signed 16 bit, stereo audio at a sampling rate of 44100Hz. Some CD Recorder programs require wav files in that format. Use the Effects | Resample command in GoldWave to change the rate, if necessary. Use File | Save As to choose the Wave type and select the PCM signed 16 bit, stereo attributes. Audio is not stored in MP3 format on a standard CD. Unless you need to conserve hard drive space or have a CD player that plays MP3 files directly, the MP3 format should not be used. The MP3 encoding process lowers the quality of the original audio. The reduced quality may become noticeable if you do further processing on the file (the Remove vocals effect in GoldWave, for example, is adversely affected by the MP3 encoding process). Files do not have be converted to cda format. See this link for information on cda files. Refer to the question above for more information. GoldWave is not a CD-Recorder program, so it has no direct way of setting or controlling tracks on a CD. That is a function of your CD-R software. Check to see if the software supports setting tracks manually. Some CD-R programs create a track for each file written. You can use GoldWave's Cue Points tool to split a large file into seamless track files. You would set a cue point at every place where you want a track (play the file and press Ctrl+Q to quickly set cue points), then use the Split File button under the Cue Points tool. That will create a set of CD sector aligned track files for burning to a CD. You will still need to configure your CD-R software to use "disc-at-once" mode with no silence between tracks. Click here for more information from the CDR FAQ. How do I copy audio from a CD? Use the Tool | CD Reader command (or CD Audio Extraction command in GoldWave v4).